At Mission Eye Care, we are proud to offer Keratoconus treatment in Calgary – being the leading provider of both diagnosis and management of keratoconus (KC) for patients in both southern Alberta as well as our neighbouring provinces. We offer non-surgical optical correction for those with keratoconus. Our doctors have advanced residency training in specialty scleral and hybrid contact lens designs that can restore sharp vision, read more here. A new study from the Netherlands show that the prevalence (number of people living with KC) is 1 in 375 people1. If we extrapolate that to the city of Calgary, with a population of 1.266 million people, there are expected to be 3,376 people with KC within our city alone. The incidence (number of new cases per year) is 1 in 2000 people. At Mission Eye Care, our Optometrists have special interest in corneal disease and know that each case of keratoconus is different. Typically, KC first presents at the age of puberty and progresses over the next 10-20 years. Eventually, after age 40-45, progression usually halts. Severity of the disorder varies from very mild irregular astigmatism, to severe thinning, protrusion and scarring, which may require keratoplasty (a corneal transplant). Albertans are fortunate as Alberta Health Care now covers Corneal Crosslinking (CXL), which is a surgical procedure meant to stabilize the progression of KC so keratoplasty is not required in the future. We recommend any patient under the age of 40, whose condition is still progressing, have CXL done prior to being fit with contact lenses as the shape of the cornea will change after surgery. 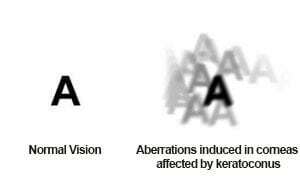 Patients with KC often find they have large amounts of astigmatism, and may suffer from blurry vision, even while wearing glasses. Haloes and starbursts at night are also commonly noticed with KC. At Mission Eye Care, diagnosis can be confirmed with topography, which measures the shape of the front of the cornea. “Normal” corneas should be of a regular, spherical shape. 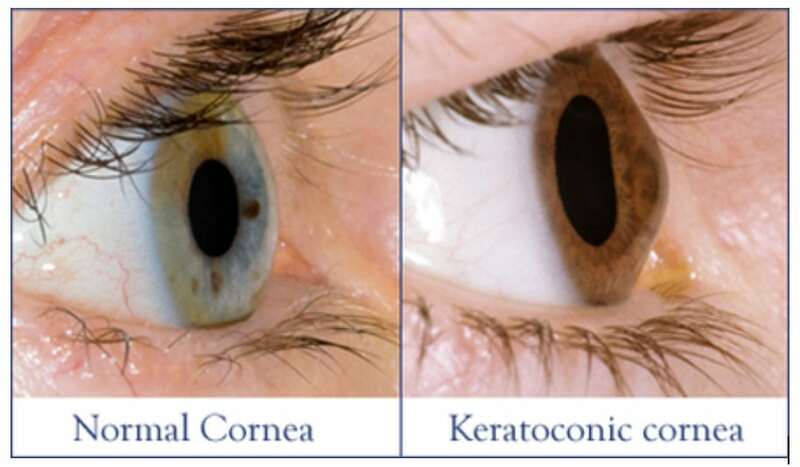 Corneas with KC typically show steepening of the inferior cornea, resulting in protrusion and thinning of the cornea over that area. CXL is strongly suggested for any newly diagnosed patient under the age of 40 to ensure progression of KC stops. CXL does not improve vision on its own, however, some surgeons elect to also perform a laser correction procedure at the same time as CXL to both halt progression of KC and reshape the cornea to improve vision. After CXL, specialty contact lenses have the potential to improve vision, in many cases, close to 20/20 vision can be regained. These lenses are able to establish a more spherical shape to the front of the eye, allowing light to focus properly onto the retina. At Mission Eye Care, our doctors have highly specialized training to determine which type of specialty lens is best suited for each patient (insert link to specialty lens page here). Some surgeons offer INTACS (intrastromal corneal ring segment) to improve vision, although the results of this procedure vary, and many patients still require glasses or specialty contact lenses after the procedure. Rarely, progression of KC continues to progress, causing corneal scarring or thinning of the cornea to such an extent that rupturing of the corneal layers may result. In these instances, keratoplasty (corneal transplant) is recommended. There are many different types of corneal transplants, the most common types for KC are a full-thickness transplant, or a partial transplant of only the anterior (front) layers of the cornea. Many patients will still require specialty contact lenses after transplantation. If you or someone in your office may be affected by keratoconus, please contact our office to book an appointment to discuss your unique needs. Our clinic has long been one of the largest fitting centers for specialty lenses in Alberta. We carry a large number of custom fitting sets and invest in the latest tools and technology to provide world class care for our patients with keratoconus. We are also the only clinic in western Canada to have the custom molded EyePrintPro prosthetic lenses for advanced corneal disease.